The bond between mother and child is bound by the instinct of nurturing. It is the core of all things living, from the conception of galaxies to the most minute organisms. It is eternal, bypassing death, like a piece of art that continues to inspire people through time. 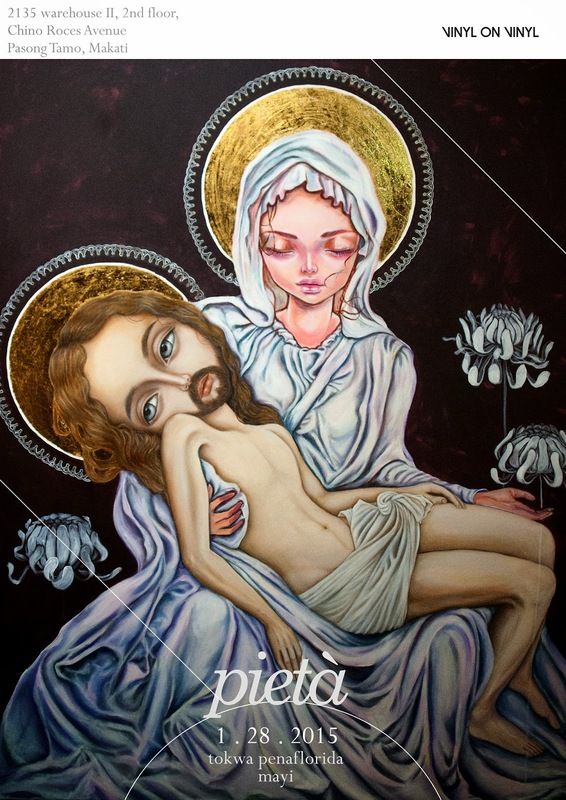 Michaelangelo’s, La Pietà, inspired mother-and-son artists Mayi and Tokwa Peñaflorida to illustrate the bond between mother and child and to juxtapose it to the concept of creating art in their two-man show, Pietà. Mayi, whose influences include John William Waterhouse and William-Adolphe Bouguereau, twists the classical style with contemporary form, morphing the human anatomy: enlarged heads frame oversized and glimmering eyes, svelte necks and limbs, clothed in an intricately detailed drapery. With the works of Gustav Klimt and Alphonse Mucha as his inspiration, Tokwa maintains the dark, dreamy, and romantic qualities of his paintings in which he is known for. The two artists’ style, although starkly different from each other, converge as they explore the softness and caring nature of motherhood. Their main piece, Pieta, is a reinterpretation of Michaelangelo’s famous sculpture and is the cord that holds their show afloat. Mayi painted Christ, while Tokwa painted Mary—the son painting the image of the mother, and the mother painting the image of the son. This creation process is a symbolic illustration of their concept, the mother who conceived and gave birth to her child, is a part of her, and it is her that truly sees—feels—the suffering of her child. Same as with the son, who was nurtured and cared for by his mother, and has an astronomical emotional connection with her. The creation process of any artist—writers, sculptors, painters—is similar to a mother who carries a child in her womb. The artist’s womb is his brain, where the concept is the unborn child, nurturing it with his observation of the world, his visions, and inspirations. He feels the strongest attachment to it, as it is his, made by his own synapses and neurons and emotions. As he executes his art, on paper or marble or canvas, he delivers his child into the world. And at that point, his child is no longer entirely his—it is now for the world to see, and for the world to nurture. He becomes physically parted from his child, forever. However, this feeling of loss, solidifies the unseen, maternal bond. Pietà by Mayi and Tokwa Penaflorida is not a representation of this—it an incomplete experience, where the audience is given space to conceive.